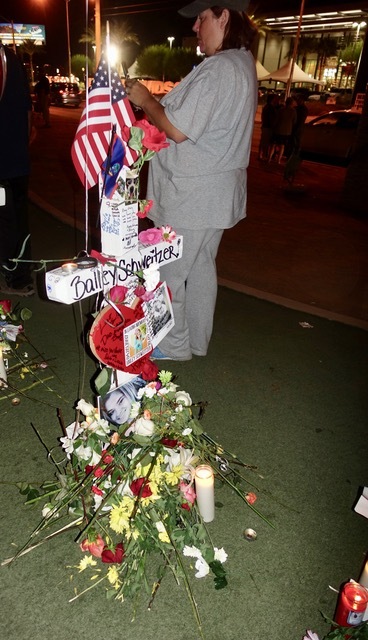 (CAPTION: THE CROSS OF BAILEY SCHWEITZER, THE YOUNGEST VICTIM.) PHOTO: NORM CLARKE. The Viva Las Vegas vibe has dramatically changed at the Welcome to Fabulous Las Vegas sign. Once a mandatory stop of camera-mugging tourists who wanted to memorialize their trip to America’s playground, the site of the iconic sign is now somber. Palpable grief has replaced joie de vivre, the French term for the joy of living and the lifeblood of Las Vegas. The mood changed Wednesday with the arrival of 58 wooden white crosses to commemorate the 58 victims of the deadliest mass shooting in U.S. history on Sunday. Near the end of the long line of white wooden crosses, Ed and Gloria Avila of Las Vegas, and some strangers, were taking matters into their own hands. They had found the crosses of Ed’s niece, Denise Cohen, of Carpenteria, Calif., and her boyfriend, Derrick “Bo” Taylor. They were among the few couples who were killed together by the hail of automatic gunfire. Someone pointed out to the Avilas’ that Cohen and Taylor’s crosses were separated by some distance and suggested they put them together. “I said, ‘Let’s do it,’” said Avila, a 66-year-old retiree and former member of the special forces in Vietnam. “We had people walk back, pick up Bo’s cross and the flowers and move it up next to Denise,” he said. “Everybody started clapping, happy they were together again,” he said. Tears of agony streamed down the face of his wife, who was on the verge of collapse when someone steadied her. Cohen was 58. Taylor, 56, was a 29-year veteran of the Nevada Department of Corrections and Rehabilitation. Hours later the Avilas went to an area in downtown Las Vegas that was being turned into a park in memory of the fallen. “We made sure Denise and Bo’s photos were placed next to each other on the memory wall,” he said. About a dozen crosses away, the largest group of mourners gathered around the cross of 20-year-old Bailey Schweitzer, the youngest victim. Her devastated mother, Krissy, was on her knees, embracing the cross as Wiz Khalifa’s song “See You Again,” featuring Charlie Puth played on endless loop on a small speaker placed at the front of the line. The mother and daughter from Bakersfield, Calif., had attended the Route 91 Harvest Festival country concert together. At one point, a television cameraman moved in to capture the excruciating scene. Bailey’s grandmother angrily confronted him and the cameraman moved on. A few minutes later, a man in his 40s saw me standing about 25 feet away, in a suit, and walked toward me. Judging from his demeanor, and what had just transpired, I was certain he was going to request no photos be taken. I was wrong. He wanted to know if the crosses could be purchased. They will remain at the site for 40 days and then be given to the victims’ families. A familiar face appeared among the thousands who made the sad pilgrimmage to the famous sign-turned-memorial. It was international Hall of Fame boxing referee Joe Cortez. He was there to sign a yellow over-sized boxing glove hanging at the base of the sign, above dozens of votives, bouquets of flowers and assorted items honoring the victims. Earlier in the day, he said 15 prominent boxing figures had signed the glove. Visible signatures included boxers Mike Tyson, Leon Spinks, Earnie Shaves, Livington Bramble, referee Richard Steele and Michelle Corrales, president of the Nevada Boxing Hall of Fame. He recalled that a major boxing match at Madison Square Garden in New York was cancelled after the 9-11 terror attacks in 2001. Las Vegas will survive the horrific tragedy, said Cortez, who turns 74 on Friday. “We might get knocked down, but we always get back up,” he said. Amid the wave of humanity showing unprecedented community support were two nurses with American flags in their hands. Sabrina Webb, 40, and Rhonda Piazza, 47, were still in their hospital scrubs. They had placed flags on every cross. When I returned to ask the Avilas a question, a woman in a blue shirt and tattoos walked up. When she walked away, I asked Avila if it was a friend. No, he had never met her, he said. I caught up to the woman and asked if she was at the concert when the gunman, Stephen Paddock, began his murderous volley. “I was at the top of Mandalay Bay in the Foundation Room,” said Kristi Moore, 45, referring to the ultra private lounge on the 43rd floor. She and two friends were there in hopes of meeting country star Kane Brown and hanging out with him. They were at a VIP table on the open-air balcony when loud, massive gunfire erupted below them. The killer was on the 32nd floor armed to the teeth with modified weapons that spit out nine bullets a second. Suddenly uniformed men burst onto the scene, pointing their weapons at the patrons. Moore vividly recalls seeing horrified patrons throwing their drinks and “even paper napkins” at the the intruders, who were loudly ordering the patrons to get on the floor and stay facedown. After the armed men cleared the area, they identified themselves as SWAT team members. “They said we were in the safest place,” said Moore.